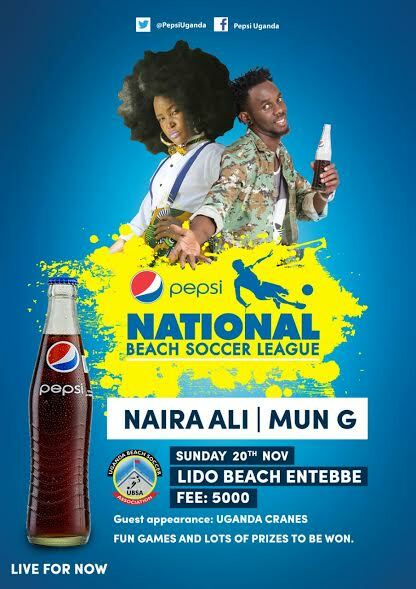 Kunta Kinte Entertainment CEO Mun G and Uganda’s hottest upcoming sensational RnB diva Naira Ali have confirmed attendance for this Sunday’s Pepsi National Beach Soccer League fixture at Lido Beach Entebbe. “All I have on my schedule this Sunday is beach soccer, I shall be at Lido beach as early as 10am, I want to spend the day entertaining beach soccer fans as well as also learn the mechanics of the exciting game,” said Naira Ali. According to Deo Mutabazi the Chairman Uganda Beach Soccer Association, this weekend’s fixture is a must watch with very titanic clashes. “A part from the massive entertainment, we also have very titan clashes. We have MUBS playing YMCA, St Lawrence playing KIU among many other big teams playing,” said Mutabazi. According to the Pepsi National Beach Soccer organizers, the games will start as early as 10am and will go on until after 6pm. Entrance will be only shs5000.